The DEB theory is unique in capturing the metabolic processes of an organism through its entire life cycle as a function of temperature and food availability. 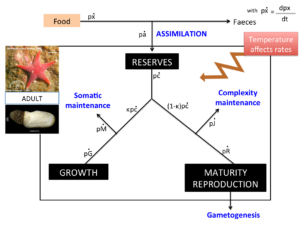 The DEB model allows for the inclusion of the different life history stages, and thus, becomes a tool that can be used to model lifetime feeding, growth, reproduction, and their responses to changes in biotic and abiotic conditions. At Biomar we work developing DEB models on Antarctic marine organisms such as seastars, sea urchins, molluscs, etc. DEB models are used to gain understanding on the physiological performance of these Antarctic species under the Southern Ocean extreme conditions. Providing insight on the effects of environmental changes on the population dynamics of key Antarctic marine species at a juncture when global climate change is rapidly altering polar ecosystems. This work is done under the frameworks of the projects vERSO and RECTO. Biomar is part of the DEBnet, an international DEB network comprising experts in a wide range of fields (aquaculture, ecotoxicology, mathematics, economics, ecology and more).